Connect your speakers directly to your plasma or LED TV with the Model 250 mini amplifier. The amplifier connects via SPDIF cable directly to any optical audio output. This amplifier combines a digital-to-analog converter with a high-grade power amplifier inside a tiny package no larger than a deck of cards. 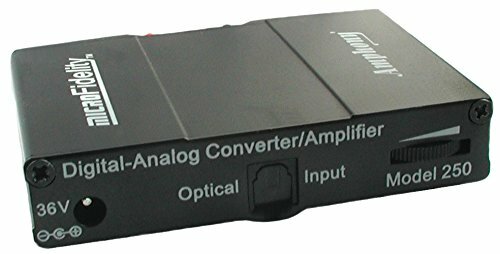 This amplifier incorporates a high-quality digital-to-analog converter with a dynamic range of 112 dBA and accepts audio up to 24 bits and 192 kHz. The built-in state-of-the-art power amplifier delivers the energy efficiency of today's best digital class-D audio amplifiers while at the same time offering far lower audio distortion at only 0.04 %. It's aluminium chassis itself provides enough cooling. No built-in fans or additional cooling are necessary. If you have any questions about this product by Amphony, contact us by completing and submitting the form below. If you are looking for a specif part number, please include it with your message.